The Project SEARCH High School Transition Program is a one-year program designed to prepare students with disabilities who are in their last year of high school eligibility for entry-level employment. The program builds essential job-specific and employability skills needed to gain and maintain meaningful employment, lead productive lives and become integrated in an adult work environment. The program integrates career exploration with a variety of worksite experiences, skill levels and related coursework. Through this unique employer-led training program, both intensive classroom and skills training will occur in the employment setting. 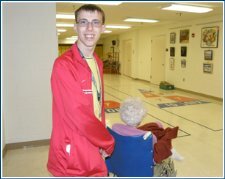 This partnership with Otterbein-Lebanon Senior Lifestyle Community allows students to interact with staff and residents. Classes are held on the Otterbein campus. Students who are enrolled in Project SEARCH will participate in a series of worksite rotations as part of their career-technical training which will lead to the outcome of employment. Contact Instructor Nick Vrettos at 513-696-8509 or Nick.Vrettos@mywccc.org.